With miles of beaches lining its famed shoreline, New Jersey may seem like an unlikely place to have a bunch of water parks. However, many of the parks are actually located along the state's boardwalks and boast ocean views. Sure, folks seeking relief from summer's heat could head to a beach. But if they want to enjoy some water slide thrills as they cool down, only a water park will do. Most of the parks are outdoors and are open seasonally. But a couple are indoor water parks and are open year-round. You wouldn't be able to romp in the ocean during the colder months (unless you have an unusually high tolerance for chilly water or a really good wet suit), but you can still have some bathing suit-clad fun at indoor water parks. The following New Jersey water parks are arranged alphabetically. Breakwater Beach is a medium-sized outdoor water park with a New England theme located at Casino Pier along the Jersey Shore. Attractions include a lazy river, an interactive water play center, a mat-racing slide, speed slides with launch chambers, and a wave pool. This is a medium-sized indoor water park resort with a Key West theme located at The Hotel ML. The water park is open to registered hotel guests, and day passes are also available to the general public. Attractions include body slides, raft slides, a lazy river, an indoor/outdoor spa, and an interactive water play center with smaller slides and a tipping bucket. Hurricane Harbor is an enormous outdoor water park. Unlike many other amusement parks that offer water parks, it requires separate admission from Six Flags Great Adventure. Attractions include a halfpipe slide, a funnel ride, speed slides, body slides, tube slides, a mat-racing slide, two family raft rides, a wave pool, and an interactive water play center. Mountain Creek is a huge outdoor park located at Mountain Creek resort, which features skiing in the winter. It has alternately been known as Action Park (and in its early years was the site of a number of park-related injuries; its attractions are considerably safer now). Attractions include the High Anxiety funnel ride, speed slides, enclosed slides, a wave pool, lots of activities for small children and an interactive water play area. OC is a small outdoor water park located on the boardwalk. Attractions include water slides, a lazy river, and a children's splash area. The park also includes a climbing wall, a jumping attraction, and mini-golf. Pirate's Cove is a medium-sized outdoor park that is included with admission to the Land of Make Believe theme park. Attractions include a bowl slide, a halfpipe slide, a lazy river, an interactive kids' area, and other water slides. Part of Morey's Piers along the Jersey Shore, Raging Waters is a large water park. 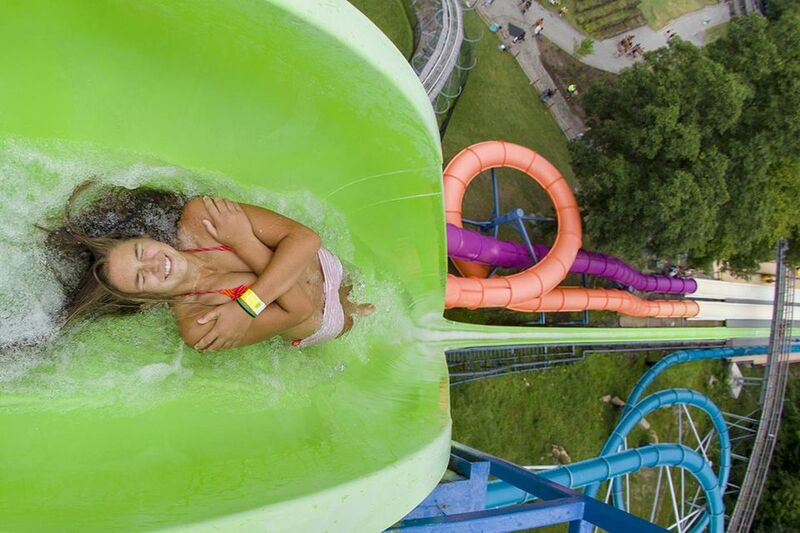 It includes over 50 slides and attractions including Hydroworks and Shipwreck Shoals water play areas, body slides, a lazy river, and tube slides. Located adjacent to Keansburg Amusement Park on the Jersey Shore, Runaway Rapids is a large outdoor water park. Attractions include Castaway's Creek lazy river, the Volcanic Revenge uphill water coaster, and the Splash, Rattle & Roll interactive play area. Sahara Sam's Oasis is a good-sized indoor waterpark with a family raft ride, tube slides, a wave pool, an activity pool, a FlowRider surfing attraction, an interactive water play structure with tipping bucket, a lazy river, and body slides. It also includes outdoor water attractions during the warmer months as well as an arcade. Unlike most indoor water parks, Sahara Sam's is not connected to a hotel. There are some nearby (unaffiliated) hotels. Splashplex is a small outdoor park located at The Funplex. Attractions include speed slides, tube slides, an activity pool, an interactive water play structure, and a lazy river. Indoor and outdoor dry rides and attractions are also available. Another small Splashplex park located at (a different) The Funplex. Attractions include speed slides, a splash pad, tube slides, an activity pool, an interactive water play structure, and a lazy river. Indoor dry rides and attractions are also available. In 2019, the complex added bowling, go-karts, and a drop ride. Splash World is a medium-sized outdoor park that is located adjacent to Clementon Park and included with admission to the amusement park. Attractions include the Caribbean Cove interactive kids' area, Endless River, Sky River Rapids, and the Black Viper enclosed slide. Splash Zone is a good-sized outdoor park along the Jersey shore. Attractions include a Tree House interactive play area, body flumes, speed slides, family raft ride, Adventure River, and a kiddie area. Thundering Surf is a small park outdoor on the Jersey shore. Attractions include a lazy river, water slides, a FlowRider surfing attraction, and a water play area for young kids. The park also includes mini-golf. Tomahawk Lake is a small picnic park (yes it's on a lake) with water slides, bumper boats, beach swimming, and a Kiddie Waterworld area. The park also offers mini-golf.